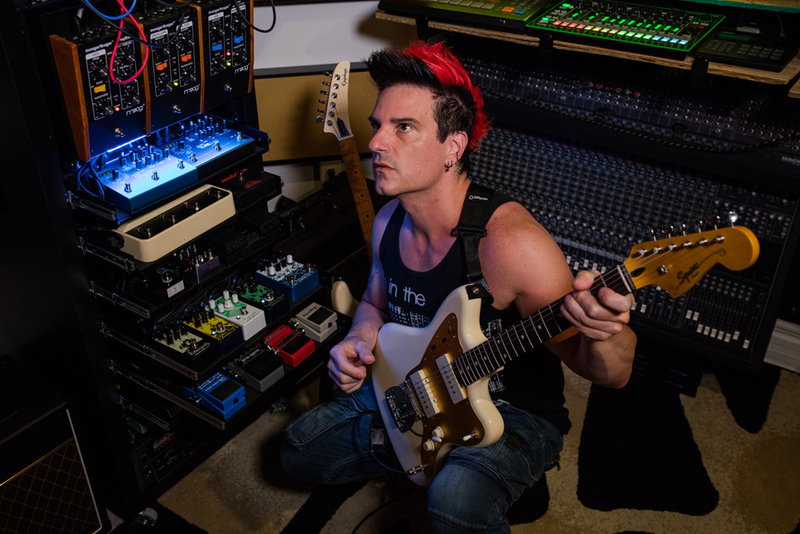 A couple of days ago I got an email about the band Celldweller and the recent pedal tower build for the guitarist / producer- Klayton. 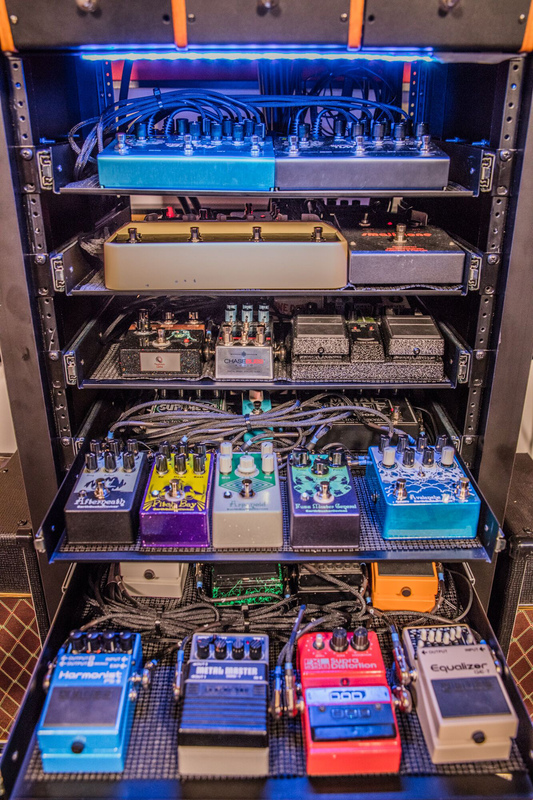 I’ve seen plenty of racks with pedals into it, but this one obviously caught my eye. This truly is a tower with 5 trays of pedals and stacked on top Moogs. Wow. I built my pedal tower without any concern for live performance or traditional setups. It’s purely configured for my production workflow. To make things as modular as possible, I have a Switchcraft 96 point patchbay that everything is wired to. This way at any time I can reroute effects order and change my sound radically by routing them anywhere amongst dozens of pedals. For my new album “Offworld” I used a lot of combinations of pedals, from Earthquaker Devices and Dwarfcraft Devices, to the Eventide H9 Max and copius amounts of Strymon Mobius, TimeLine and BigSky pedals. Also used were the Boss BF-3 Flanger, KMA Audio Dead Stag, Red Panda Particle, Soundblox Pro pedals and the OTO Biscuit. Some Chase Bliss Tonal Recall, Rainger FX Dr Freakenstein Fuzz and Stone Deaf Warp Drive make appearances as well. Sometimes the output of the tower would be run through my 2 Vox AC 15s for stereo goodness and other times I would use in-the-box solutions for diversity and for things that would be more difficult to do with hardware. Celldweller’s new album “Offworld” will officially be released tomorrow. You can check it out here. Awesome that they’re all on a patchbay.